This collection represents the first sustained attempt to grapple with the complex and often paradoxical relationships between surveillance and democracy. Is surveillance a barrier to democratic processes, or might it be a necessary component of democracy? How has the legacy of post 9/11 surveillance developments shaped democratic processes? As surveillance measures are increasingly justified in terms of national security, is there the prospect that a shadow "security state" will emerge? How might new surveillance measures alter the conceptions of citizens and citizenship which are at the heart of democracy? How might new communication and surveillance systems extend (or limit) the prospects for meaningful public activism? Surveillance has become central to human organizational and epistemological endeavours and is a cornerstone of governmental practices in assorted institutional realms. This social transformation towards expanded, intensified and integrated surveillance has produced many consequences. 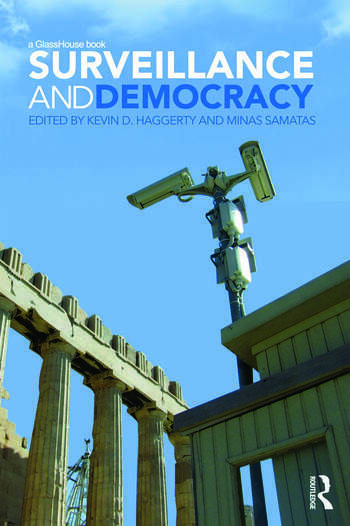 It has also given rise to an increased anxiety about the implications of surveillance for democratic processes; thus raising a series of questions – about what surveillance means, and might mean, for civil liberties, political processes, public discourse, state coercion and public consent – that the leading surveillance scholars gathered here address. Kevin D. Haggerty is editor of the Canadian Journal of Sociology and book review editor of the international journal Surveillance & Society. He is professor of sociology and criminology at the University of Alberta, Canada. Minas Samatas is associate professor of political sociology in the Sociology Department at the University of Crete, Greece, and author of Surveillance in Greece: From anticommunist to the consumer surveillance, Pella, NY, 2004.